The Indian Government yesterday decided to withdraw the Court case against fishermen detained under the custody of its Coast Guard Force in the Andaman Islands. This follows a top level discussion held with Indian Government, Deputy Minister of Fisheries and Aquatic Resources Neomal Perera told the Daily News. The discussion was held by a special Sri Lankan delegation under the direction of President Mahinda Rajapaksa. 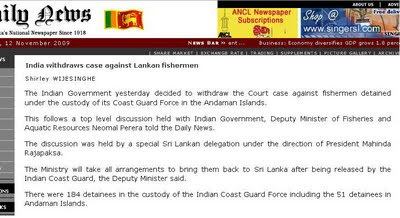 The Ministry will take all arrangements to bring them back to Sri Lanka after being released by the Indian Coast Guard, the Deputy Minister said. There were 184 detainees in the custody of the Indian Coast Guard Force including the 51 detainees in Andaman Islands.